Calculating a filter’s particulate removal efficiency. Hydraulic fluid is the lifeblood of any hydraulic system. 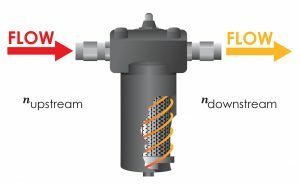 Fortunately, a hydraulic system can operate for many years with proper filtration techniques and testing. A high quality hydraulic filter is the first line of defense for your fluid’s health. (figure 1) How do you choose a quality filter element? How can you tell a cheap filter from a quality filter? 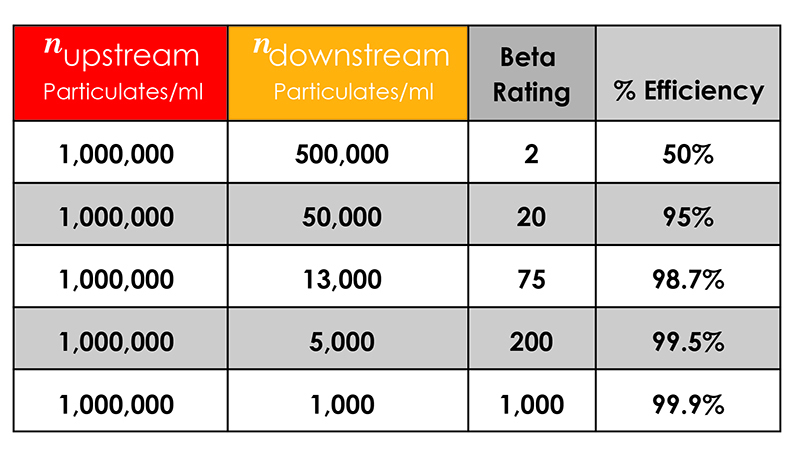 Let’s look at filtration Beta ratio and better understand how filters are rated. To understand Beta ratio, it is important to understand if your element is rated as either nominal or absolute. A “nominal” rating is an arbitrary micron value given by the manufacture based on a percentage of particulate weight removed during testing. Nominal ratings are increasingly rare as their micron ratings are inconsistent and testing methods can vary. An “absolute” rated element’s micron size is calculated as the largest particle that pass through the media during multi-pass testing and offers a more specific, consistent value. Since manufacturers are only required to publish the efficiency of the media with a micron rating, it is important to verify that your element is rated for an absolute micron. Beta ratio is often used when expressing filter efficiency for a given particulate size. This, in simple terms, is the number of particles in the upstream (before filtration) divided by the number of particles downstream (after filtration). The Beta rating comes from the Multi-pass Method for evaluating performance of a fine filter element (ISO 16889:1999). Whether you do it yourself or send samples to a lab, fluid sampling should be performed upstream and downstream of the filter to get an accurate effectiveness of the filter. 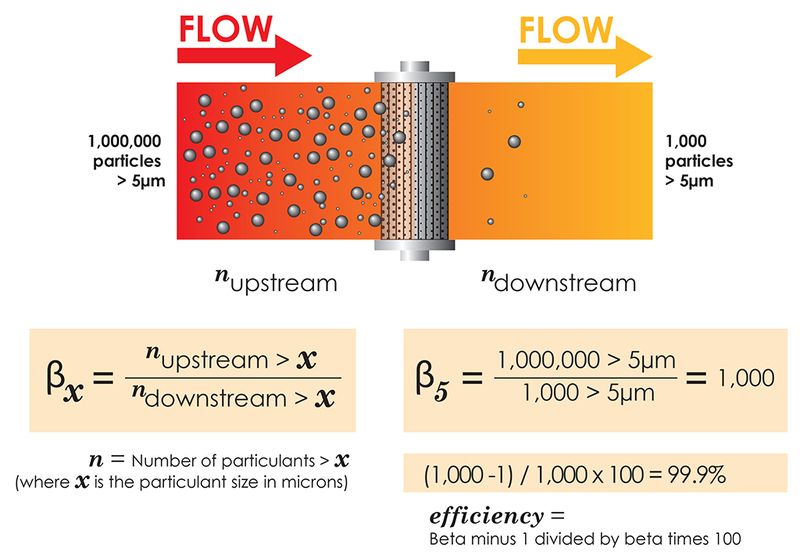 Example: If a 5-micron filter element has 1,000,000 particles upstream and allows 1,000 particles through its media, it’s Beta ratio would be calculated as 1,000,000 (upstream) / 1,000 (downstream) = β1000 (figure 2). Beta ratios can also be expressed as an efficiency percentage – efficiency % = (Beta minus 1) / Beta * 100. This Beta 1000 element is 99.9% effective. 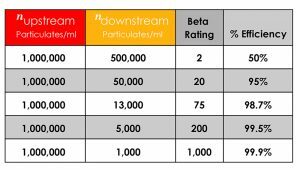 Beta ratio gives us a scientific standard to compare the filtration quality of elements. It does not address dirt holding capacity or build quality of an element, but allows us to do an apples-to-apples comparison of an element’s media pore size. To fully evaluate the quality of a filter, regular fluid ISO particle counts and dirt holding capacity tests are necessary. For further information on Beta ratios and Multi-Pass testing methods, please view the Hy-Pro publication here. Advanced Fluid Systems is ready to assist you with your fluid filtration questions.